These are the whittlings I referred to in my last entry, I actually got them done in time to wrap them for Christmas morning. A little outside my comfort zone, never tried a wineglass (or any drinking vessel) before. The cat was finished first, after two false starts this one almost went to the burn barrel too- did not like the way she was turning out, looked un-saveable. It was late, I was not happy so I put her down and went to bed, Next day, I picked her back up and figured a few more minutes might teach me something, so away I whittled, and whaddya know- little Christmas magic musta been in the air, or in my knife, and I was able to save her. My FP attitude is to use as few facets/surfaces as possible to suggest whatever I'm trying to show- I love the front legs on the cat- four surfaces only, no vee cut between the legs, yet you still know they are two front legs. I sont tell you i did that in four cuts- it took dozens, but the last four cuts covered the entire four surfaces. Biggest problem with the cat is the neck- head joint- the glass piece has a short stem glued into a hole in the top of each piece, the hole extends past the throat of the cat- I was terrified of cutting through, and insistent on getting a slender tall cat. I'm pretty sure there is only a sixteenth of wood left in some spots there. The Stack of elephants is not new to me, I've done several single elephant bottle stoppers and one stack of four or five as a knife handle. My daughter is particularly fond of elephants so here is another for her collection, My other daughter collects nutcrackers- not functional ones, the ones from the ballet- hence the toy soldier. I thought for a moment about making a working nutcracker, but the glass stem got in the way again. Bases are an end slice from a 3x3 inch basswood block, round on the band saw, beveled on the lathe then textured with a gouge. Each stem blank has a hole in the top for the glass stem and a dowel cut into the bottom. Dowel fits into the same hole I used to mount the base to the lathe. Everything is epoxied together- stem to base, glass to stem. I roughed up the glass stem a very little bit with 220 grit sandpaper to help the epoxy grab. Finish is water based urethane topped with beeswax, paint on the soldier is acrylic mixed with water based urethane topped with beeswax. Glasses I bought from Craft Supplies USA online- they have a couple projects there that might interest you whittlers out there. Hey, thanks for looking. it felt reel good to spend some time whittling again. Gotta go- took orders for more glasses over Christmas dinner. No dip for these chips, Dog is the only one who will eat them. Got to sit down and make a few today, finally started the little gifts I have in mind for Christmas. In general, I prefer Christmas wait politely for Thanksgiving to have it's day, but I found some time and some wood and my latest favorite knife- I love it when they all come together. To all the whittlers out there, may your blessings be as plentiful as your chips. May your knives be sharp, your Bass straight grained, and your thumbs out of the way. I don't post pics of things 'in progress', I prefer to wait till a thing is done to show whoever cares to look. For me, items in progress can be hard to identify..... I've stepped outside my comfort zone with the current whittling, I've started over 3 times now and the next time I pick up a knife I'll start again. Sometimes I can think about a project and know right where to start, sometimes I need to make extra 'blessings' before I figure things out. One of the advantages of working on little things, I guess- do overs don't cost much. Perhaps the 4th time will be the charm. I might be a little further ahead, but on the second try I grabbed a piece of Maple instead of Bass. Surprisingly, my knife held up fairly well- unlike my thumb. I've read on the WCI forum that some folks model their work in clay before starting to carve, I can see some positive points to that. I'd have to start with a square(ish) block I guess, perhaps I should give that a try. Challenged to whittle a themed stopper by a WCI forum member who heard I was in a slump gave me the incentive to finally whittle a human caricature I've been thinking about for a couple years. Here's my version of a character in The Outlaw Josie Wales, Chief Dan George plays Lone Wadie, one of Clint's sidekicks. The challenge was to whittle a caricature of a western character from TV, could be movies, serials, or even cartoons. Have to admit I thought of Quick Draw McGraw for a couple seconds. I did a practice face first, using step by step instructions from Harley Refsal's book Whittling Little Folk- thanks Harley, not the first time you've helped me out. I missed a couple details, like always there are things I'd do different on the next- I think we owe it to ourselves as artists to critique our own work and look for those items we'd improve. Major thing I'd change is the head-meets-hat line- the head should enter the hat at 90 degrees; I tapered the head into the hat and it looks like the hat is too small. His mouth also turns down too much, makes him look angry- something Lone Wadie never was in the movie. While planning this little project (that took forever) I used the Interweb to find reference photos. I don't like to trace, and I don't have a printer (last one died of dust asphyxiation after sitting for a couple years unused). How to create a pattern or sketch? I knew I had to get the proportions right in order for the figure to work. Here's what I landed on: took a piece of lined paper with one half inch ruling, cut a square hole the size of my blank, in this case 1.5 x 5" and zoomed individual images in or out until they fit my rectangular hole. I made the hole extra tall so I'd have some room to adjust, my blank ended up just over 3" tall. With a couple extra tick marks on the top & bottom of the hole, also spaced at 1/2", I was able to locate reference points on my basswood block for important features, including tilting the hat. I think I'll either get a clear acetate sheet to fit my computer screen, I can tape a paper window to the acetate, or an acetate sheet with a 1/4 or 1/2" grid on it. This way I was able to use images for different sizes, collected from wherever I could find them, and view my subject from multiple angles. I feel good about the result, all in all, and must have done something right- couple folks on the forum who love the movie like I do knew right away who I intended to carve. That's a success. heck my wife even knew- she's been in the room often enough when I was watching the movie, made sometime in the seventies I think it was, it's been on my tv a bazillion times. She didn't get it 100%, her comment was 'its that Indian from that movie', close enough to a bulls-eye for me. Today I'll write about Onions. The blog is called Whittling and Other Affairs. I have been doing a little whittling, but I can't talk about it -yet. So on to onions- I love onions, I don't mind onion breath either. I also love to dig in the dirt (what boy doesn't?) Seems kinda natural to grow onions, right? I don't grow normal onions though. I grow topset onions, or walking onions, Egyptian walking onions (I have no idea if they are really from Egypt). I do know they are fun to grow and perennial even here in zone 5. The pic's not great, but here they are the first year I tried. Ran across them on the 'net, found a seller on EBay, it was late in the year but she assured me they'd have no problem with snow and frost. So I bought a couple dozen sets in November (I'm in Buffalo NY) and planted them in the bed out back just before the snow flew. The pic is what they looked like mid summer the next year- they really did overwinter. The cool part is, they grew scapes the first year. 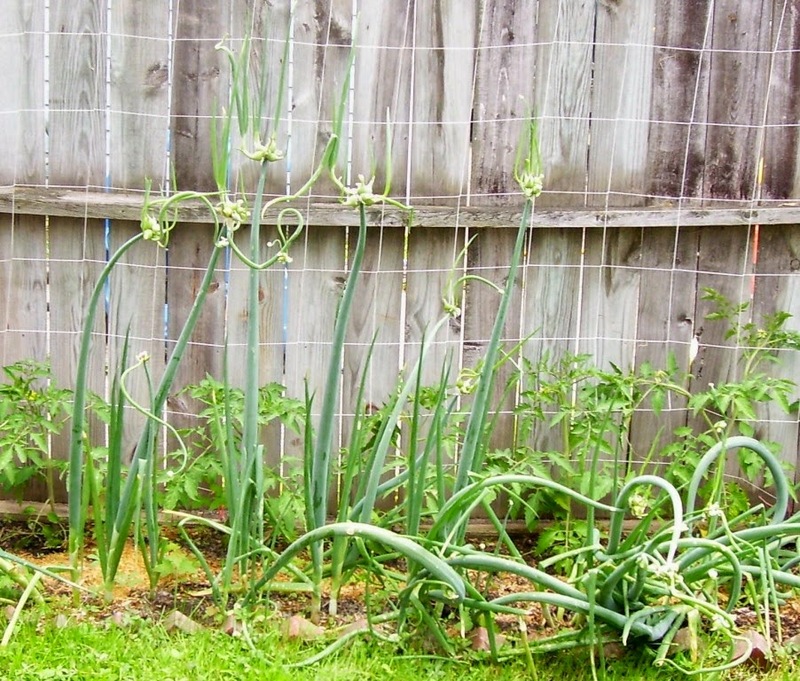 With most onions, scapes grow the second year and have flowers- walking onions don't grow flowers, they grow little onions, usually 5 or seven on each plant. The onions are small, like cooking onions, but tender (harvest them one year old or less) and pretty potent. I planted 27 bulbs in Nov, the next summer I had 27 onions and about 150 new bulbs to plant. Wish I could do that with money. Well they've been out there for the last 6 years or so, neglected most of the time because of a major renovation project on my house taking up all my sunny days. I still have a few dozen onions out there, mostly growing wild- they are not stopped by weeds or cold. The scapes eventually fall over and some of the bulbs take root- that's the walking part. I'd have a LOT more if more of the scapes fell into the neglected veggie bed and not into the lawn. Last fall I planted a bunch of the sets into a not-very-well prepared bed, trying to grow them properly. I intended to harvest them early as scallions, but once again life got in the way and they have set scapes again- I'm planting sets now and eating onions. Its not unusual for me to come in from the back yard smelling of them this month. I'm taking a different approach to the sets now-break the biggest one off each bunch and plant it alone, plant the rest of the bunch together to encourage them to grow more like scallions. I'm planting them deeper than I have been too- shallow planted bulbs are largely brown and tough skinned, the deeper planted ones whiter and more tender. I'll try three inches deep or so this time. Based on last fall, I might get some scallions out of them this year. I suspect I could have a nearly endless supply of onions as scallions or as little cookers if I work it right. Well thanks for stopping by, and letting me ramble. I've had quite a rash of knife orders the last few months, it's very gratifying. There is something special about making tools, both for my own use and for others. I was fortunate one of my first jobs as a cabinetmaker I worked with a true Yankee- he not only taught me woodworking, tool use and maintenance, he also taught me to modify tools to suit my needs and make them if need be. Thank you Gary, may you rest in peace. So for a while, I won't be making knives to order. I've taken down my knives for sale page here- I have a few more to make, promises to keep, and then I'm done. I have a long (and growing longer) list of things I'd like to whittle and will take a sabbatical to work on that list. The sound of little figures hollering to be let out of blocks of wood is growing louder, they need my help. I suspect I'll make a knife here or there, on spec, and will post here and on the WCI forum when I have one to offer. I need a more laidback approach, I have some designs and methods I want to try. I appreciate all the feedback I've gotten from all the carvers who have my knives. Thank you.